First, let's get some technicalities out of the way. On Thursday the Rays can expand their "active roster" from 25 players to 40 players — the famous "September Call-Ups". A player must be on the Rays 40-man roster before he can be called to the team. 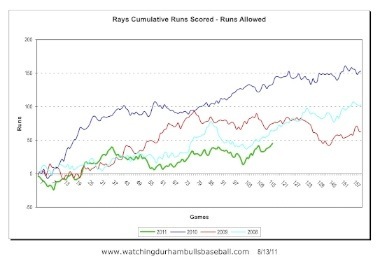 To my surprise only Rays Index and The St Pete Times Heater blog are doing any speculating. Obviously the Rays are going to promote players they think they need or they think they want to take a look at. Past is not prologue here. Remember that last year the Rays won the American League East and were looking at the playoffs. Every player on this list except for pitcher Chris Archer and catcher Nevin Ashley has had his "cup of coffee" this year, albeit just a sip or two — not even enough time for one of those little cups over in Ybor City. 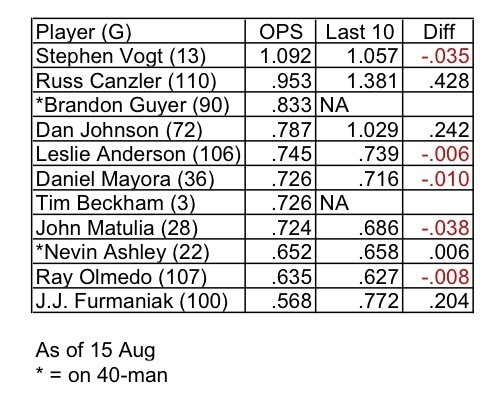 And there are a couple of loose ends on the DL, notably catcher Jose Lobaton and outfielder Justin Ruggiano. Lobaton is reported to be close to being ready but hard to tell about Ruggiano. In addition, the Rays are famously willing to game the DFA/waiver/options/DL rules to their advantage. So who's not on the 40-man that could be a candidate? How about these guys? A coin toss on Lobaton coming to the Bulls for rehab or staying with Rays in place of Chirinos. In any case the Rays will want three catchers. Ruggiano will go to the Rays when they think he's ready, probably with the call-ups. A non-roster invite to spring training for Vogt and Russell. Moore will obviously go on the 40-man just as soon as the system requires it (surprised he isn't there already, might be some legalistic reason). What will it do to the Bulls for the playoffs? Pretty sure it won't do much harm assuming that not being called up doesn't get into the heads of the guys left behind. We've seen plenty of talent from Montgomery this year. Russ Canzler has been named the International League Most Valuable Player for 2011. The former 30th round draft pick had never played above the Double-A level before signing with Tampa Bay as a free agent this past offseason. Having seen significant time at third base, first base, left field, and right field, the versatile Canzler has made his biggest contributions for Durham at the plate. He is 4th in the International League with a .312 average to go along with 18 home runs and 79 RBI. His 61 extra-base hits, 77 runs scored, 241 total bases, and .533 slugging percentage are all tops in the IL. In July, Canzler was elected as the starting third baseman for the IL at the Triple-A All-Star Game, where his three-run home run was the difference in the 3-0 contest. He is just the second IL player ever to win Top Star honors at the Triple-A All-Star Game and the League MVP award in the same season, following in the footsteps of another Durham Bull, Kevin Witt in 2006. Canzler is the fifth Durham player to win IL Most Valuable Player honors, along with Steve Cox in 1999, Toby Hall in 2001, Witt in 2006, and Dan Johnson last season. Now, let's see if we can get you on the 40-man and some playing time with the Rays this year. The sky was a brilliant blue. Inside the park all evidence of the storm was gone. With the win on Saturday the Bulls seemed to be themselves again. If there was a wisp of a cloud on the horizon it came in the 2nd when Matt Moore gave up a rare walk. He would end up giving up four of them during his six innings, adding to the worrisome 36 issued by Bulls pitching since this home stand began. When Moore left after six innings, the Bulls were down 3 to 1. But a Ray Olmedo single and a Justin Ruggiano home run in the bottom of the 6th set things right. J.J. Furmaniak came in to run for Dan Johnson in the 7th, but that tactical move of Charlie Montoyo's didn't pay off ... then. The payoff came in the extra-inning 8th when the game was still tied and Brandon Guyer was on third after a triple. Justin Ruggiano drew a walk. J.J., the Bulls best bunter, came to bat with one out. Guyer was off on Furmaniak's hard bunt past the pitcher in the direction of the second baseman. He was past the Charlotte catcher and the game was won. Interlude watching the grounds crew put things right. Diligent restoration of both sides of the batter's box. Refilling of the holes dug by pitchers out on the mound. Brushing and smoothing and redrawing the lines. After 10 minutes the eye is treated to a fresh baseball field just waiting for new teams to emerge from the dugouts. First there was the presentation of this year's Goodmon Awards: Team Spirit — Ray Olmedo; Pitcher — Rob Delaney; Community Service/Fan Favorite — Russ Canzler. Great choices, congratulations, well-done Ray, Rob, and Russ. The Bulls came on the field and we got to watch a superb performance by Matt Torra. Mr. Torra has quietly established himself as a key Bulls pitcher. 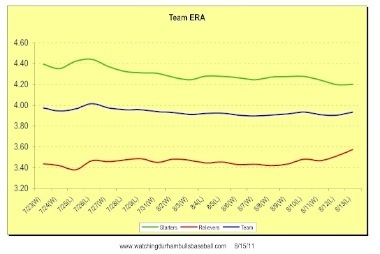 His ERA has been steadily declining since his not very auspicious arrival in early July. He has won four out of his last five starts. 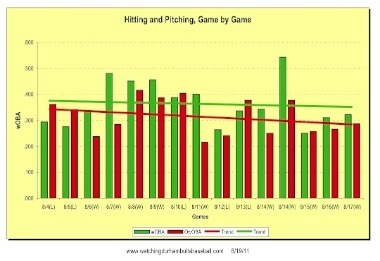 By my little "efficiency" measure (pitches per out), he is the most efficient pitcher on the team. He only needed 69 pitches to get through six innings last night (Moore threw 99). You could make the argument that he should have stayed in for the 7th since Delaney made things a bit more exciting than they needed to be with a one out walk followed by a single. But he did close things down, he got a save, and the Bulls had their shutout. Brandon Guyer led of the game with a home run over the Monster. In the 3rd Guyer singled, stole second, went to third on a Stephen Vogt fly ball, and came home on a Dan Johnson single. A Russ Canzler double was enough to bring Johnson all the way around — although I'd have to say that Charlie Montoyo's arms windmilling to send D.J. home were moving faster than Dan's feet. That was enough. Out on the web these two curious entries from Dirk Hayhurst, last seen leaning on the dugout railing. The first complains about Durham drivers (not very good, that's a surprise?) and the second is an odd little piece reflecting on expectations of a professional athlete. He seems to think that fans will be disappointed that he doesn't play for the "love of the game." As far as I can tell, that isn't the average fan's expectation, certainly not today. Must be something about the folks he encounters out there in the bullpen. Funny how a win, even a shaky win, defers the Apocalypse. Just yesterday we were wondering if the Bulls had been abducted by aliens and today we're standing in the sunshine on the back porch and checking the playoff calendar. Let's deal with Hurricane Irene first. 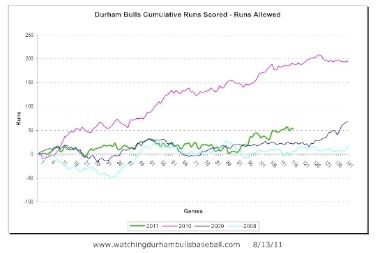 The Triangle area dodged the bullet and besides, as broadcaster Neil Solondz noted the night before last, the team is the Durham Bulls, not the Apex Bulls or the Cary Bulls or the Raleigh Bulls. That is, they are tough guys — once they get over this abduction thing. So what's a little wind and rain gonna do? Well, for one thing, a bunch of those Apex, Cary and Raleigh folks (like me) stayed home and watched the game on TV. The attendance number of 9,549 needs a great big "paid attendance" asterisk, because if there were more than a couple of thousand I'll chew up a page of my scorebook. And what we TV watchers saw for the first four innings or so was a lot of wind and rain and interesting pitching. This was Chris Archer's first AAA start. Pretty good. More than that, and good news for Bulls fans, he needs a good bit of work. That means we'll likely be seeing a lot of him next season. The bad news is that, much like Matt Torres, he's likely to scare/disappoint us from time to time. Last night, for example, he got two quick outs in the 2nd inning then a walk, double, and two more walks brought in an easy run for the Knights. Except for that inning, however, he looked very good and put in a nice six innings for the Bulls. For more background on Mr. Archer, Adam Sobsey did a piece for Indy Week a couple of days ago. Meanwhile, Charlie Montoyo sent out a lineup of all right-handed batters against Charlotte lefty Doug Davis, leaving on the bench lefties Dan Johnson, Stephen Vogt, and Leslie Anderson. They did just fine, especially outfielder Matt Carson who had two doubles. Dane De La Rosa (need to do a feature on him) did a solid two innings. Rob Delaney had a thrilling 9th that we could have done without. And there we were, a win! Remember: Double header tonight! Two for the price of one. Irene is coming and will likely come ashore in eastern North Carolina sometime tomorrow. Last night could be the last baseball we see before Sunday or even Monday. However, maybe, just maybe, we'll get a game in tonight. If so, and if you were not here back in 1996 when Hurricane Fran came through, take a moment to ask your neighbor what it was like. Trust me, you will hear a couple of terrific stories — chainsawing paths out of neighborhoods, huge neighborhood cookouts to prevent the waste of food thawing out in freezers, steamy un-airconditioned evenings, and more. They've been waiting for someone to listen to their stories. Nearer in time, as it was back in September, 2010, what we Bulls fans really care about is what effect Irene might have on this weekend. Based on the home stand to date, how could it get worse? So it's gotta get better, right? Brian Baker took the loss last night, but he deserved better. The performances of relievers Lance Cormier and Mike Ekstrom were just pitiful. The Bulls had an oh-so-tenuous lead when Cormier came on with two runners on base. Cormier let those two guys in, plus four more. That put the game pretty much out of reach. And it was surely so after Mike Ekstrom let four more runs across. Except for a flurry of activity in the bottom of the 9th, that was about it. Nice to see Justin Ruggiano on the field. Noted that he was announcing his major leaguer status by wearing long trousers. Guess that's sort of cool, but maybe a bit of showing off in front of the guys he played with for a long time? If so, then he ought to collect a couple more hits. Have I mentioned that this has been a miserable home stand so far? Guess what? Among the 60+ games so far this year, the Raleigh News & Observer decided to write up last night. Well, not actually a write-up. More a cut-and-paste from the Bulls website. My hometown paper doesn't even deserve a link from WDBB for that. Of course, they don't do any better with the Mudcats over on the other side of town. Back to the threat from Irene. We can expect the Bulls website to do a good job regarding tonight and then tomorrow's double header. Last look implied that we are on the edge of this storm, so seems like a good chance that three games could get rained out with no chance of makeup. 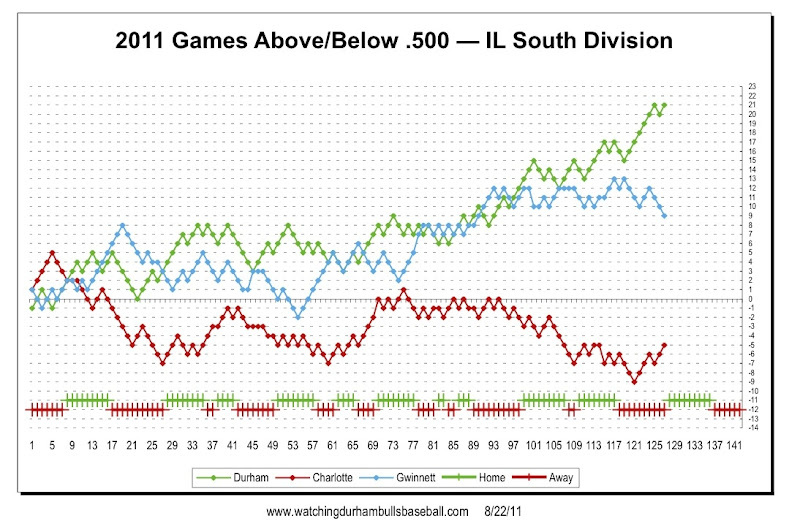 Since Gwinnett has been beating the teams the Bulls are getting beat by (Gwinnett has two wins over Charlotte and one over Norfolk in recent days) the season is at risk. The Monday and Tuesday games against Gwinnett are suddenly very important to those of us obsessing about the Governors' Cup. 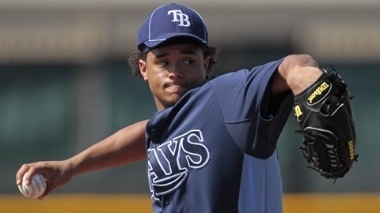 Stacy Long is reporting that RHP Chris Archer is on his way to the Bulls. Adam Sobsey over at Indy Week is reporting the transaction as well. Chris Archer is the very personable young (22 year old) pitcher who came to the Rays system from the Cubs in trade for the Rays' Matt Garza. That trade also included current Bulls Brandon Guyer and Robinson Chirinos, Rays outfielder Sam Fuld, and shortstop prospect Hak-Ju Lee now with the Biscuits. Mr. Archer is from Clayton, so we can expect a flurry of interest from the newspapers that generally ignore the Bulls such as the Raleigh News & Observer. Important to us is that the Bulls may at last have a legitimate fifth starter in the rotation, something we haven’t seen since Richard De Los Santos (remember him?) went on the disabled list back in mid-April. Even if Archer's stats are not world-beating, he’s been able to start 25 games this year for the Biscuits. That’s more than any pitcher on the Bulls roster — which says something about the turmoil in that role this year. Welcome aboard, Chris. Have been looking forward to seeing you pitch all year. The first oddity of the night was how hard Matt Moore seemed to be working. Nevertheless, he made it through six scoreless innings and all seemed right in the world. The Bulls were ahead 4-0 on four solo home runs (Guyer, Carson, Beckham, Johnson). That would be another oddity of the early part of the game. 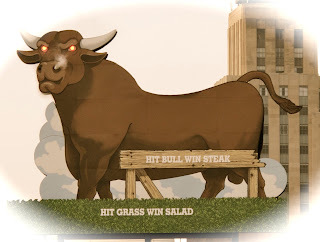 At that point the Bulls bullpen, with a combined ERA of 3.45, could be depended upon to close out the next three innings and we'd be on our way home by 9:30 or so. The next six (count 'em, six) Bulls pitchers had their fair share of trouble, but it was Jay Buente and Adam Russell who did the most damage by putting runners on base, then giving up home runs. It could have been worse, I suppose, since the Bulls got out of a bases-loaded (all on walks) situation in the 7th. Nevertheless, by the end of the 7th, the score was tied and stayed that way until the 13th. In that inning Joe Bateman, much like every other Bulls pitcher, could not handle Norfolk's Carlos Rojas. Here's a guy batting ninth in the order, barely above .200, who got on base five out of six times last night (three walks, two crippled singles). As it happens he didn't score any runs, but it says something about Bulls pitching that he got on base at all, much less five times. Sometimes a day off is not a good thing for baseball. Maybe that's all it was. Alex Torres tonight. Still playing the Tides. The Bulls have to play these guys five more games this year, tonight at the DBAP, plus four games in Norfolk at the end of the season. Might as well get used to seeing Manager Gary Allenson put on his show. Last night's had something to do with how many times you have to touch second base when you're not sure you've hit a double or a home run. Maybe he'll get tossed early and we will have a shorter game. To end on a high note: If you went to the game you got to see third baseman J.J. Furmaniak make a couple of stellar plays. The Durham Bulls baseball team, the Triple-A franchise of the Tampa Bay Rays, returns to the Durham Bulls Athletic Park today (Tuesday) after 10 games on the road. 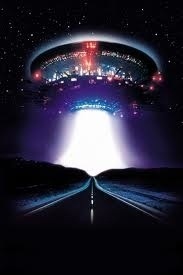 The trip took them to Buffalo, New York; Scranton, Pennsylvania; and Norfolk, Virginia. They won seven out of the ten games. Terrific. They are well above the .500 mark (74-53) and are 6 games ahead the Gwinnett Braves (Atlanta) in the contest for the International League’s South Division championship. The Bulls have played 127 games out of a 142 game season that ends in early September. For more details about the Bulls and the International League, take a look at Bulls Basics. The Durham Bulls are a mix of major league veterans, prospects (young players moving up through the system), and AAA veterans. What’s the difference as far as the game you see at the DBAP goes? Very little. These are all professional ballplayers who have been in the game anywhere from 4 years (shortstop Tim Beckham) to 11 seasons (first baseman Dan Johnson). They are managed by one of the most successful minor league managers in baseball, Charlie Montoyo. The Norfolk Tides (Aug 23-24) are the Baltimore Orioles AAA team. They are not having a good year (49-79), much like their parent club. The Bulls just split a two-game series with them in Norfolk and will finish the season playing them in Norfolk for four games September 2-5. The Charlotte Knights (Aug 25-28, 5 games) are the White Sox’s AAA affiliate. At 5 games below .500 (62-67) they are not having their best year, but they are a dangerous team. Their series will feature a double header on Saturday (Aug 27) Sunday (Aug 28). The Bulls will play two more games against the Knights in their stadium on Aug 31 and Sep 1. 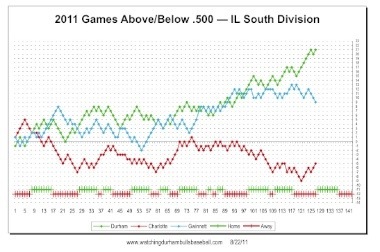 The Gwinnett Braves (Aug 29-30) are the Bulls lead competitor for the South Division Championship and have a shot at the Wild Card slot in the IL Championship. Good pitching. This could be a key series for the Braves and the Bulls. The Bulls roster turned over in July. Half of the pitchers and fielders were new to the team, some sent down from Tampa Bay, some up from the Montgomery Biscuits (the Rays AA team), and some purchased outright from other teams. All of them have done well. A couple have gone back to their original teams. Matt Moore is possibly the best pitcher in minor league baseball. He should be pitching today. Alex Torres, another talented left-hander, will probably pitch Wednesday. Starters Matt Torra and Andy Sonnanstine have had very good games recently, but the fifth slot in the rotation is up for grabs. The Saturday double-header screws up any projection beyond that. The Bulls have one of the best bullpens in AAA. If a starter can get through five or six innings, the relievers can usually carry the load. The new guys are simply fun to watch, including catcher/outfielder/first baseman Stephen Vogt, catcher Nevin Ashley, and shortstop Tim Beckham. They are all recent call-ups from Montgomery. Outfielder Brandon Guyer is a rising star. You will want to say you saw him play as a Bull. He's my guess as a possible call-up to the Rays if outfielder B.J. Upton's injury yesterday is more serious than early reports indicate. Outfielder Russ Canzler is having a breakout year. He’s WDBB’s favorite for a September call-up to the Rays. Dan Johnson’s power has been erratic this year. But flashes of last year’s Johnson shine through from time to time. Catcher Robinson Chirinos just returned from a stint with Tampa Bay. Ray Olmedo, J.J. Furmaniak, and young Daniel Mayora are (along with Tim Beckham) a formidable infield. They turned six double plays in a game last week. First baseman/outfielder Leslie Anderson is recovering from a very painful hit by pitch a couple of nights ago. Outfielder Justin Ruggiano is with the Bulls on a rehab assignment. If he plays, expect some serious power at bat. An ex-Bull, he knows the DBAP better than any player on the field. Also a possible immediate return to St. Petersburg if Upton's injury is serious (and Ruggiano's rehab goes well). Speaking of the DBAP, our park got some love from Stadium Review recently. After these nine games, the Bulls play six games on the road and that’s it. No more baseball for 2011. Except, the Governors’ Cup playoffs! That’s a possibility of four more games at the DBAP. In 1933....the Governors of Maryland, New Jersey, and New York and the Lieutenant Governors of the Provinces of Quebec and Ontario sponsored a trophy to be awarded annually to the winner of the International League playoffs. Buffalo won, Rochester was the runner-up, Newark and Baltimore were in the playoffs. Over the years four "international" teams have won the cup: Havana, Toronto, Ottawa, and Montreal. More. The 10,000+ fans who came to see Alex Rodriguez on Wednesday dwindled to 3,000+ for Thursday. Apparently most of those came to see the Bulls' Russ Canzler. He put on a show for them and got some love in the local newspaper. Deservedly so. The local lad (from nearby Hazelton) had three hits, including a big home run in the 8th. Every year it seems the Bulls have a non-40-man roster guy who is beating on the door of the Rays in August. This year it's Russ Canzler. We can hope that the Rays are listening — just wait for the playoffs to be over, if you don't mind. Meanwhile the Bulls infield continued with some simply stellar baseball. Six double plays! OK, two of them came after errors by Bulls' infielders that let runners on in the first place, but six in one game has to be some sort of season high. (Am I too lazy to go leafing through all the box score? You bet I am.) Ray Olmedo's hitting might have fallen off a cliff since coming to Pennsylvania (0-8), but he and Tim Beckham make one heck of a pair out there at short and second. Pretty to watch them. Beckham, by the way, got his second home run of his brief AAA career. His rep was not as a batsman, but 7 RBI in 8 games for a leadoff batter is quite an accomplishment. With that kind of defense, as long as you're not giving up home runs, a pitcher can do just fine. Alex Torres went seven innings, Jay Buente finished off the last two. The Bulls have won five in a row. The Yankees have lost eight in a row. Brian Baker is starting tonight. Time for the big bats to roll out, cause Baker is gonna give up a couple of runs. We like Mr. Baker a lot, but he has only pitched 3 innings since July 25. We hope he's ready to come back. Speaking of coming back, catcher Robinson Chirinos, last seen in a Bulls uniform in Pawtucket on July 16, is coming back. John Jaso has finished his rehab and went to St. Petersburg yesterday. With Brandon Guyer back and covering center field, outfielder John Matulia was sent to Montgomery. Hope he's ready to come back, because I'm guessing the Rays are gonna want to take a look at Guyer in September. Pleased to read that Alex Cobb's surgery was successful. 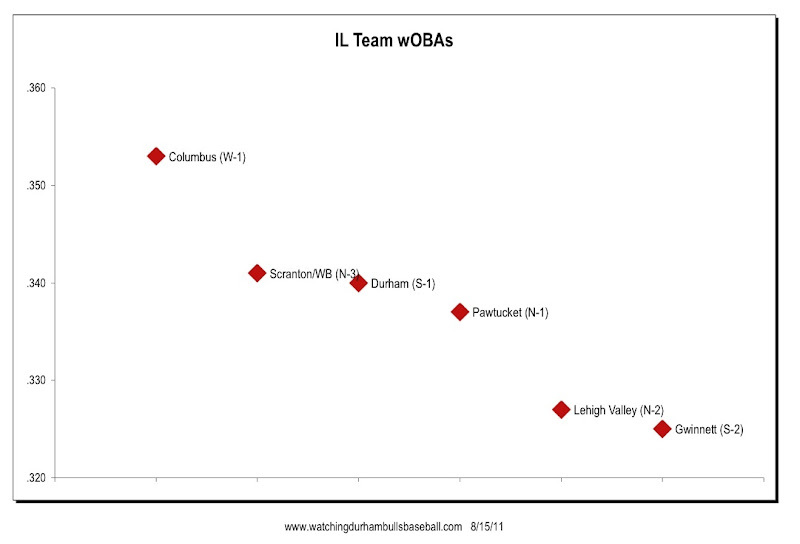 What we're looking at here is the team wOBAs for each of the last 15 games. The green bars are the Bulls, the red bars are the Bulls' opponents. The Bulls won 10 of the last 15 games and the widening gap between the trend lines helps explain why — pitching and defense has been just terrific. By the way, the Bulls are now 20 games over .500, the best they've been all year. It sounded like a good fraction of eastern Pennsylvania came to Moosic to boo Alex Rodriguez the last two nights. I guess I don't understand the hostility he generates within Yankee fandom. But they drove out to the park to watch him play and give him a hard time. He responded by giving balls away to youngsters near the third base line. In the meantime, the Bulls won two games, making it four in a row and putting them nineteen games above .500. That's the best they've been all year. Gwinnett has split the last two games and is four games back in the South (2.5 in the Wild Card). Toledo has joined Rochester and Norfolk in falling completely out of contention. The first game saw four batters hit by pitches (two by Yankees pitching, two by Bulls pitching), but none of them scored. No HBPs in the second game. Matt Torra looks better each game he pitches. The Bulls are inching toward having a starting rotation! Four out of five slots (Torra, Moore, Sonnanstine, and Torres) are doing pretty well. What about the fifth slot? Not much hope there unless Hayhurst comes off the DL or the Rays decide to promote someone from Montgomery. In the first game, Matt Carson, the new guy we haven't seen on the field in Durham yet, hit a home run and Dan Johnson knocked in John Jaso. Torra, Beunte, and Delaney combined for the Bulls first shutout in a couple of weeks. Matt Moore had his least effective start as a Bull in the second game, but at least the pitchers quit throwing at each other's batters. And Moore got another 8 K's (in just four innings) while only allowing one run (a homer). His pitch count was way up by the end of the 4th though (84). How about the Bulls rehabber, John Jaso? While all the attention was on Rodriguez, Jaso seems to be coming along. He DH'd on Tuesday and caught his first complete game on Wednesday. 1-8 at bat with 1 walk and 4 K's, so needs some work. Hope that it doesn't come at the Bull's expense. Don't like seeing Vogt out of the lineup when he's been so hot. Speaking of being hot, Russ Canzler got one of the RBIs last night. This is, sort of, a hometown crowd for him. And then there's Tim Beckham with another triple and two of the runs scored last night. I missed the last couple of lead-ins to the game broadcasts. If someone has heard the update on Leslie Anderson, please jump in. He was hit by a pitch in the second game on Monday and limped off the field. Has not played since. To be honest, given the track record of the last two games, I was really worried about the bottom of the 7th in the first game yesterday (7-inning game). The Bulls had gone ahead 2-1 on a triple by young Mr. Beckham that drove in Ray Olmedo. I was putting gas in my car and had rolled down the rear window so I could hear the game. Andy Sonnanstine had gotten the first out but then gave up a single. Rob Delaney came in. A popup for the second out. Runner on first stole second. Gas pump dings. Batter grounds out to Johnson at first. Game over. Breath easier. Put nozzle back on the pump. Go on home. At home with MiLB TV fired up for the second game, I begin to wonder if some bad karma could be out there. Former Bull Fernando Perez hit his very first home run (!) 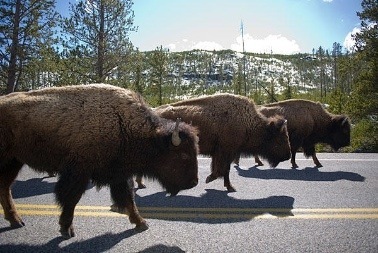 as a Bison and put Buffalo ahead 3-1. The Bulls got one back in the 4th, but then another former Bull, reliever Dale Thayer, came in for the 6th and weaseled out of a bases-loaded, one-out situation. The planets come back into a proper alignment in the 7th, however, when Mr. Beckham hit a double, got to third on a Brandon Guyer sacrifice, and came home to tie the game on a Stephen Vogt sacrifice fly. Mike Ekstrom kept things under control in the bottom of the 7th and Russ Canzler led off the 8th with a game winning home run, the first home run for a Bull since August 10 (Canzler and Ashley). The icing on the cake was Tim Beckham's grand slam three batters later. 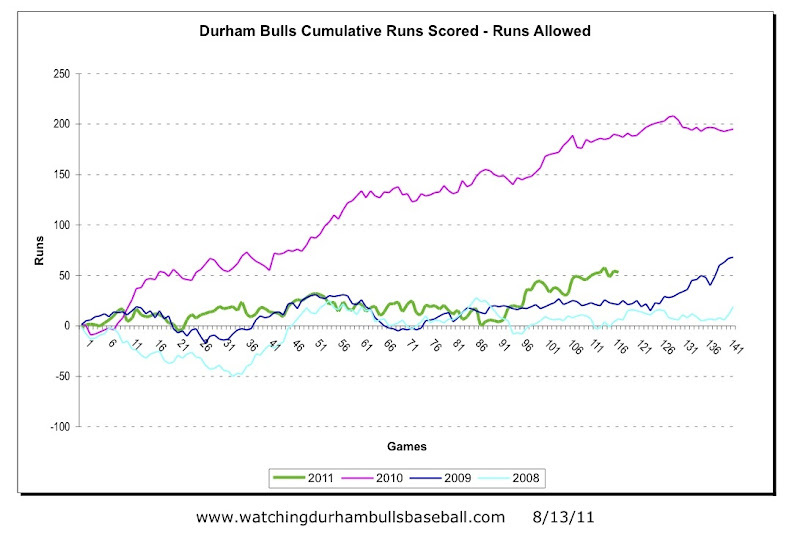 Beckham hit for the cycle over the two games and accounted for five of the ten runs scored by the Bulls, not bad. See the Buffalo News link above for some comments by Beckham and Charlie Montoyo about his stellar night. Dane De La Rosa came in to close things out and the Bulls were off to Scranton/Wilkes-Barre. Expect intense press coverage of the Bulls-Yankees games the next couple of nights. But not likely to have anything to do with Tim Beckham or Justin Ruggiano's bursitis of the knee. Alex Rodriguez is scheduled for a rehab start with the Scranton/Wilkes-Barre Yankees and the eyes of Yankee faithful will be watching what he does. A challenge for Bulls starter Matt Torra. The sweep of the double header puts the Bulls three games ahead of Gwinnett. With recent losses, Norfolk and Rochester have been officially eliminated from contention. Two notable things about the game: Brandon Guyer was back in the lineup and did very well; and the bullpen lost the second game in a row. Rainout last night. Double header starts at 5:00 today (7 inning games). About that bullpen. 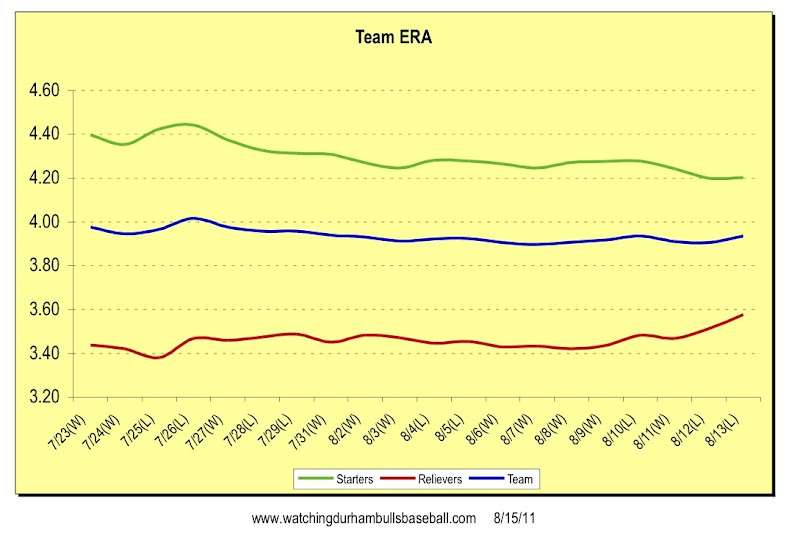 This chart shows the cumulative ERAs of the Bulls starters, relievers, and team for the last 15 games. With the team at over a 1,000 innings, the numbers are hard to move. But the last couple games are discouraging. Let's hope it's an anomaly. The bullpen has made a huge difference this year. The Bulls need for them to keep it up. How about the hitters? Pretty good. For the last 10 games, the ups are really up (Canzler, Johnson, Furmaniak). And the downs are minor. 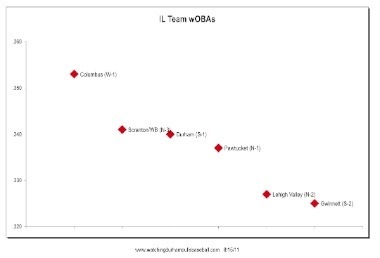 I really like wOBA as a measure of offense, but from this scatter chart it doesn't look like it tells you all that you'd like about wins and losses. These are the teams with a shot at the playoffs. Scranton/WB is 7 games back in the North Division and 6 games back in the wild card. Their wOBA is awfully good, though. They are the Bulls next opponent and based on their wOBA, the Bulls could have some work to do. Source: StatCorner. The Bulls started off the game with three straight hits and scored one run off Bison starting pitcher Pat Misch. Misch then struck out the side (and struck out 9 more Bulls in his 8+ inning start). The Bisons started off the bottom of the 7th with three straight hits off reliever Dane De La Rosa, scoring a run. A hit by pitch and a grounder added a second run, and a wild pitch scored a third run. That was enough to win the game. Matt Moore had a good night with a solid six innings. De La Rosa had an awful 2/3 of an inning. To his credit, Pat Misch went 8 1/3 very well-pitched innings. I was not happy to see Dale Thayer come on for the last two outs of the 9th. For some reason the sight of Fernando Perez in a Bisons uniform doesn't bother me as much as Thayer. Dirk Hayhurst looks at some of the cross-cultural dynamics burbling under the surface in minor league ball. Time to take a look at the runs scored/runs allowed picture. Not bad at all. The Pythagorean Expectation for the Bulls based on these numbers is 64-54, well below the actual 67-51. The general thinking about variation with the expectation is that it's a function of luck and bullpen, i.e., the Bull's bullpen is doing a great job and they've had some luck. Makes sense to me. Our bullpen has been doing a good job ... mostly. How about the guys who play in the bandbox by the bay? They are also on an upward trend. Their Expectation (64-54) exactly matches their actual record. The Bulls are off to Buffalo today after a very good 5-3 home stand. They have four games in Buffalo, four games against the Scranton/Wilkes-Barre Yankees, two games against the Norfolk Tides, a day off, and then are back here for their last home stand of 9 games (including a double header on August 27). Matt Torra, who has been improving steadily since his arrival from Reno, had a very solid seven innings last night. The Red Wings did not get a baserunner until the last of the 3rd inning and didn't get a runner to second base until the 5th. Torra isn't a strikeout kind of guy, but he doesn't walk many either (none last night). He lets the fielders do the work and last night that worked out just fine. Particularly notable was John Matulia's over the shoulder grab of a Justin Marneau shot to deep, deep centerfield in the 6th and J.J. Furmaniak's nifty grab of a foul ball out of the Red Wing's dugout in the 7th. Torra did give up a home run, but that was it. Adam Russell (let's be very quiet here and not disturb anything) continued his 0.00 ERA performance since his arrival. Rob Delaney closed out the 9th. Russ Canzler continued his amazing performance — walk, single, triple, 2 runs scored. He leads or is close to the lead in a bunch of International League categories: Doubles (#1), Slugging (#1), Runs Scored (#1), Total Bases (#2), RBI (#3), Hits (#3), OBP (#2), Extra Base Hits (#1), Batting Average (#4), OPS (#1). Ray Olmedo almost hit his first home run of the year, but the umps got together and decided that the ball hit the top of the fence. But Ray got 2 RBI out of the hit at any rate. His double was part of a four-run 2nd inning that was enough, with Torra's pitching, to win the game going away. Tim Beckham's first game as a Bull was notable for not being notable. He handled several plays straightforwardly and got an infield hit. As seem to be the norm this year, we can expect more roster changes as the Bulls hit the road. The Herald-Sun and the Indy Week links above report that Justin Ruggiano is coming back to the Bulls as part of a rehab assignment. The Indy Week piece expresses some of the same cynicism that I have about this move. My hope is that Ruggiano doesn't let his maltreatment by the Rays affect his play. He could be a huge asset over the next couple of weeks, and he doesn't count against the Bulls 24 man limit. The same links are also reporting that Brandon Guyer and Matt Carson may be about to come off the DL. If so, someone will probably have to leave. My guess would be John Matulia back to Montgomery. There are some terrific photos at the Indy Week link. According to a couple of sources (MLB.com, St. Pete Times) Alex Cobb will undergo surgery in a few days to remove a "blockage" near his right rib. To be honest, I haven't a clue what that means other than he won't be pitching again this year. Cobb started the season with the Bulls and made two trips to Tampa Bay before sticking there on the third trip. Twelve appearances with the Bulls, 5-1, stellar ERA of 1.87. We were indulging ourselves with the fantasy that he might come back for a couple of games. That isn't going to happen. In fact, if the Rays want to take it easy on their starters for the rest of the year, they now have a space on their 40-man for someone like Matt Moore. Alex Torres and Andy Sonnanstine are the only Bulls starters on the 40-man. One of them could be going up soon. Marc Topkin is reporting that Reid Brignac is going back to the Rays. Justin Ruggiano going on the DL made room. At the moment that leaves the Bulls with only 10 active position players — Brandon Guyer and Matt Carson haven't been playing. With Jaso here on rehab maybe they can get by in the near term, but have to think an outfielder will be called up before the hit the road on Friday. Was fun having you here, Reid. Best of luck down in the bandbox by the Bay. Update: As Jamie commented and Stacy Long just reported, shortstop and top prospect Tim Beckham is on his way. We've been waiting to see this young man since he was drafted in 2008. I was, of course, wrong in my prediction, but what's new there? Have to say that I think this is a terrific choice. Beckham will also have the chance to play with Ray Olmedo for a while, which I think would be a help. That brought to mind Alex Cobb’s recent trek to the disabled list. My concern is that the Rays are not paying enough attention to Cobb’s workload this year. First I need to point out that this quote also set my teeth on edge. It is from the MLB.com item on Cobb going to DL. Buried in the article that reported Alex Cobb going on the disabled list was this comment. Cobb did not say anything to Joe Maddon prior to -- or during -- Saturday night’s game. The Rays manager said that Cobb needs to be more up front about any problems in the future. What struck me about Maddon’s quote was that it sounded like classic “blame the victim” kind of thinking. Alex Cobb is 23 years old and has never done anything in his adult life except play baseball. Was he supposed to go whimpering to the manager if his arm doesn’t feel quite right? Not very likely. Shouldn’t all those coaches be watching a youngster like Cobb? So far this year Mr. Cobb has pitched in 9 AAA games and 12 major league games for 119 innings. That’s as many innings as he pitched in all of 2010 in AA (he pitched 10 more innings in the AAA playoffs) and about the same number of innings as in 2009 (124). He pitched a few more in 2008 (139). Does it make sense for him to have pitched 119 innings by August 6th of his first year in the majors? What do you think? Is there someone out there who understands all this pitch f/x stuff that can do a deeper analysis? Did the Rays break young Mr. Cobb? I was sitting next to a teacher of Shakespeare last night, so forgive the headline. Nevertheless, it does point out to a key feature of the game: The Red Wings put a lot of runners on base, but the Bulls turned four double plays. Here's the quirk (of course there's a quirk, why else would I mention it? ), two of the four were started by the pitcher. Alex Torres has had better starts. It took him 91 pitches just to get through five innings. On the other hand, in the 5th he had runners on second and third, one out, and got two K's to end the inning. Russ Canzler continues with a hot bat, single, two doubles, two RBI. Leslie Anderson continues to struggle, 0 for 4. 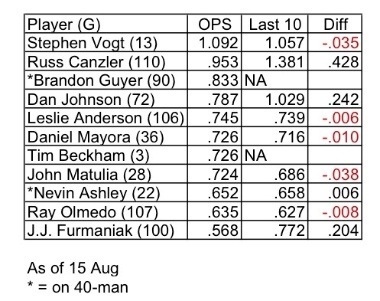 Stephen Vogt's 9-game OPS of 1.111 warms the heart (along with two critical RBI last night). The highlight play of the evening came in the 9th. Adam Russell came in to close, but the first batter dinked one over third base. The sacrifice bunt was popped up and Russell stretched out all of his 6'8" and flopped to the ground, catching the ball. By that time the runner on first was standing on second. He had no chance of making it back before Russell tossed the ball to first. (Note: play is on the video highlights at Bulls website.) Russell's first save. In four appearances no runs scored. The big deal was the appearance of famous big leaguer Justin Morneau rehabbing his way back to Minneapolis. I'm guessing that since he's not actually assigned to AAA he doesn't have to follow AAA rules. He was wearing a one-flap major leaguer's batting helmet. Here's a guy who's missed a lot of baseball from a concussion, but still wants to look good, I suppose. I'm reminded of the motorcycle guys protesting helmet laws. Have always thought that as long as they've signed their organ donor cards they should be allowed to go bare-headed. Maybe the same should apply to baseball players. With this win the Bulls went 16 games over .500, the best they've been all year. Could not have picked a better time in the season. As careful readers know, the business of baseball is not my forte. So when it's announced that a player has been "exposed to waivers" my reply is usually, "Huh?" 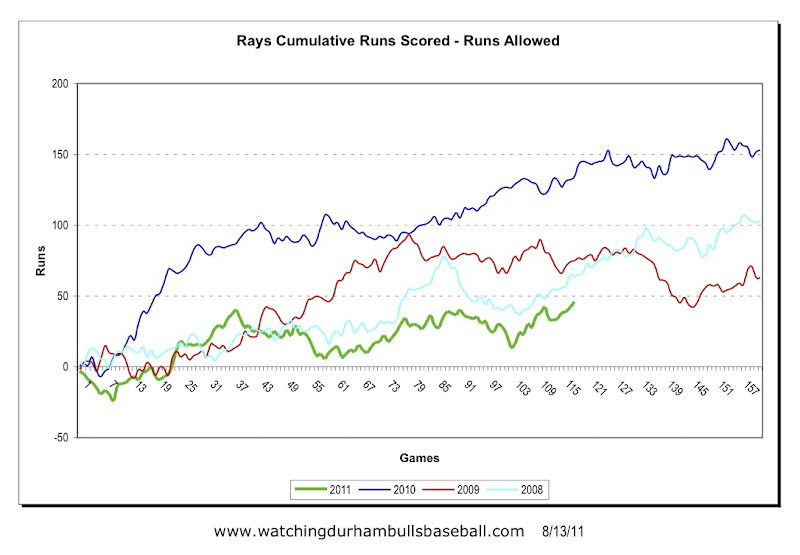 Rays Index makes an attempt to explain recent "exposures" by the Rays. Ramos had four appearances for four innings while with the Bulls. He was the only left-hander in the Bulls bullpen. Montoyo won't have to bother pointing to an arm when he goes out the the mound for a while.